Follow a three-day split full-body workout to build lean muscle. Split workouts involve training two or three individual muscle groups per workout, while full-body training revolves around hitting your whole body in every workout. Full-body workouts are generally superior for fat loss and definition, while split training is better for muscle growth, claims trainer Marc Perry, author of "The Get Lean Guide." To get the benefits of both, combine the two methods for a three-day split full-body workout. Split your body parts into three separate workouts. A common three-day combination is known as push, pull, legs. This involves training your pushing muscles (chest, shoulders and triceps) in one workout, your pulling muscles (back and biceps) in the second and then devoting one whole session to your legs. If you train three days per week this allows for full recovery between sessions while still getting real results, according to strength coach Molly Galbraith, owner of Girls Gone Strong Training. Perform your push workout on Monday, pull on Tuesday and legs on Wednesday, then take one or two days off before starting again. Your sessions should revolve around compound movements. 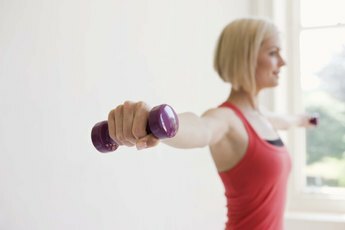 These are exercises that work multiple muscle groups and joints simultaneously. They burn more calories, boost your metabolism and stimulate muscle growth. Start each session with two or three compound exercises, advises fitness model, nutrition coach and bodybuilder Kellie Hart Davis. These could be bench presses or overhead presses on your push day; chinups, pulldowns and rows on your pull day; and squats, deadlifts and lunges for your legs. Women's fitness magazines often promote the idea that training with light weights for a high number of repetitions is best for fat loss and toning, but this isn't the case. High reps are no better for body composition than lower-rep sets using a heavy weight, claims Marianne Kane, trainer and owner of MyoMyTV.com. Heavy training will build strength but won't make you look masculine or result in bulky muscles. Switch between five sets of five using a heavy weight and three sets of 10 to 15 reps using a moderate weight. To make changes to your physique you need to progress your workouts. There are three ways you can do this, according to sports coach and member of team Elite Fitness Systems Julia Ladewski. You can increase the weight you're lifting, add more sets and reps, or change the tempo of an exercise. Aim to make small jumps on every exercise in each session. When you plateau on an exercise, simply change it to another one that works the same muscle groups. On your push day, for instance, you can switch from barbell presses to dumbbell presses or dips, swap chinups for pulldowns or rows for face pulls in your pull workouts, and change front squats to back squats or forward lunges to reverse lunges when training your legs.